Over the past few days the annual Consumer Electronics Show (CES) has been taking place in Las Vegas. 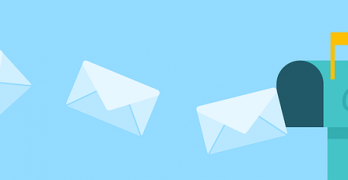 Each year, CES is one of the largest trade shows to take place anywhere in the entire world, with hundreds of tech companies on hand to show off their latest products. Apple has been a notorious no-show at the event for decades, and 2015 was no exception. 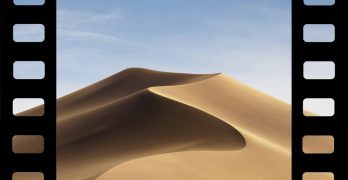 Even though the world’s most valuable company isn’t in attendance, its shadow still looms large over the proceedings however, with some of the most innovative products unveiled at the convention designed to work specifically with Apple gadgets. Here are five such products from CES that Apple fans should definitely be excited about. 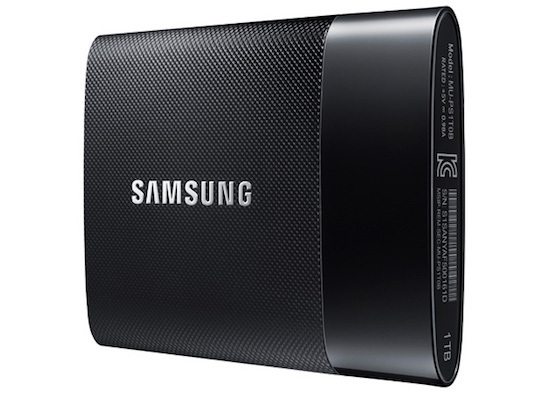 Samsung is bringing a series of incredibly lightweight and portable solid-state hard drives to the market that are sure to be a hit with Mac users. These new drives come equipped with USB 3.0 for fast read and write times (up to 450 MB/s), which nearly puts them on par with what you would find inside a desktop computer. But at just 9.2 mm thick, and with a footprint about the size of a credit card, these drives will easily slip into a pocket or travel bag without adding additional bulk. And since they feature solid-state storage, they should be better equipped to handle the rigors of travel better than a traditional drive as well. When the drives ship to consumers in a few weeks they will be available in three different sizes – 250 GB ($180), 500 GB ($300), and 1TB ($600). While those capacities are impressive, Samsung says that future T1 models could eventually scale up to 16TB of storage when it becomes cost effective to do so. Ever since Apple announced HomeKit last summer, iPhone and iPad users have been waiting patiently for the arrival of products that are compatible with the new suite of iOS integrated system tools. As the name implies, HomeKit promises to revolutionize the way we interact with our homes, giving us more control over lighting, security systems, door locks, the thermostat, and more. One of the first products to use HomeKit will be the Switch from iDevices, which plugs into a standard wall outlet and provides users with full control over anything that is plugged into it. 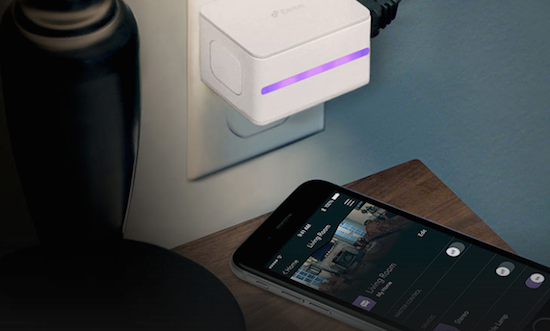 The Switch connects to iOS devices via both Bluetooth and Wi-Fi, enabling us to turn off or on lamps, small appliances, fans, and so on. Unlike other home automation devices, the Switch works completely on its own, without the need for an external hub or subscription service. It does interface with an iOS app however, using a cloud-based service to schedule and automate tasks such as turning on the lights at a specific time, or starting the coffee maker before you roll out of bed in the morning. The Switch will even feature Siri integration, giving users voice control over their home. It will ship in the first half of the year at a $50 price point. 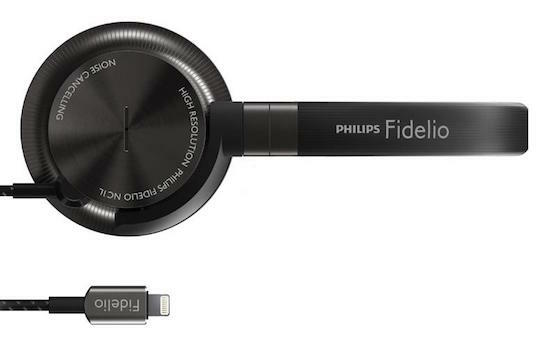 It isn’t unusual for a company to make headphones designed to work specifically with Apple products, but with their new Fidelio NC1L nose-canceling model, Philips has taken that concept to an entirely new level. These headphones bypass the traditional audio port fond on your iPhone, iPad, or iPod Touch, and plug directly into the Lightning port instead. This allows your device to providing power to the onboard nose-canceling circuitry, which uses four integrated microphones to dampen ambient sound from the environment around you . These headphones also have a built-in 24-bit digital-to-analog converter, which should produce clear, crisp sound. As you would expect, they are also capable of making and receiving phone calls, and interacting wit Siri as well. They’ll run $299 when they are released later this spring. The market is flooded with Bluetooth speakers these days, any number of which can provide quality sound in a compact, attractive, and durable package. It truly takes something special to stand out from competitors in this very crowded field, which is why Braven has taken a unique approach with the new BRV-Pro. The ruggedized speaker is designed for use outdoors, and as such it is built to resist water, dust, and accidental drops. Inside its tough exterior are quality auto components however, allowing this speaker to produce high quality sound. But what truly sets the BRV-Pro apart is its versatility, which comes courtesy of a set of optional attachments. Those attachments include a second battery pack that can keep the speaker operating for as much as 40+ hours between recharges, an LED pad that turns the device into a portable lantern, and a Qi Wireless charging pad for keeping compatible devices powered up as well. There is even an option to add a folding solar panel or a GoPro camera mount too. 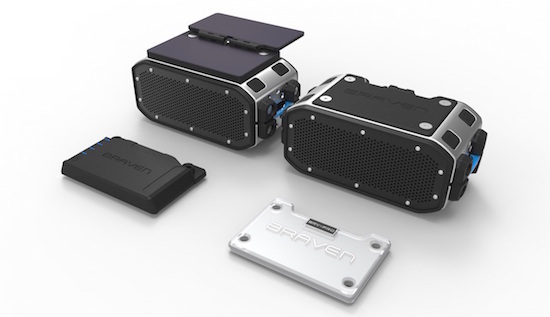 The speaker is listed as “coming soon” on the Braven website, and will carry a price tag of $149.99 upon release. Accessories will be priced between $29.99 and $49.99. The iPhone case market is another area that is incredibly tough to stand out in. There are literally thousands of options to choose from, most of which do little more than provide a minimal amount of protection for your phone. But the Zagg Speaker Case for iPhone 6 manages to distinguish itself from the crowd by not only adding a protective layer to your device, but also including a detachable Bluetooth speaker and an 1800 mAh battery as well. 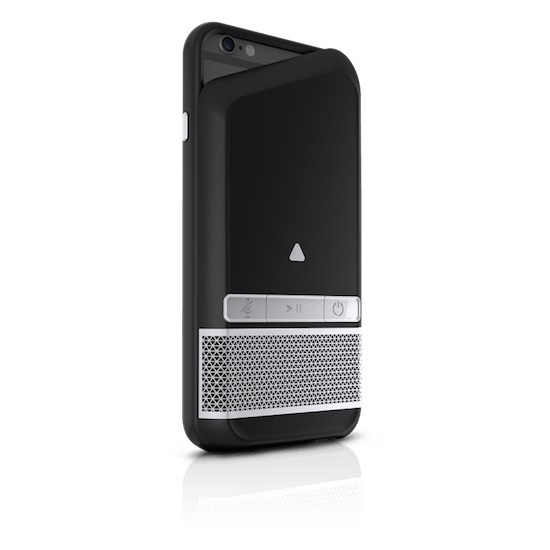 With its own mute button and microphone, this case can turn any iPhone into a powerful speakerphone for conference calls on the go. The designers at Zagg have also cleverly built this case so that the speaker can also removed and placed in an area that is best suited for listening. That same speaker can be used to wirelessly stream music, podcasts, and other audio sources as well, making it a perfect for entertainment on the go. The Speaker Case’s built-in battery reportedly adds 8 hours of additional talk time to your smartphone as well, which can help just about anyone stay more productive no matter where they go. The Speaker Case is expected to ship in the first quarter of the year at a price tag of $99.99. The fact that these headphones work by plugging into the lightning port means that they are specifically designed to work with Apple’s latest devices in ways that no other headphones have in the past. Not even Apple’s big acquisition of Beats has produced a pair of headphones like this yet, although rumors suggest we’ll soon see lightning headphones from them as well.